To sleep, perchance to dream of younger looking skin. This overnight Creme gives you the well-known moisturizing properties of sweet almond, sesame, vitamin E and avocado oils. It also offers the rejuvenating properties of rosehip seed oil, an excellent source of vitamin A. Evening primrose oil is a rich source of essential fatty acids which promote healthy skin from the outside in. Before bed, smooth a small amount over a cleansed and toned face and throat, using gentle, upward strokes. For face, hands and or body, apply as needed. For great results, mist face with our complexion mist before applying the Creme. Sweet almond oil, beeswax, rose water, vegetable glycerin, sesame seed oil, evening primrose oil, rosehip seed oil, aloe barbadensis leaf juice, avocado oil, tocopheryl acetate (vitamin E), grapefruit seed extract, rose oil, lavender oil, ylang ylang oil, tocopherol, rosemary extract, beta carotene, sodium borate (natural borax), glucose & glucose oxidase & lactoperoxidase (sugar & natural enzymes). Hannah "I actually like it"
I actually like this cream. It's a bit thick but after it sinks into your skin, which takes approximately 30-45 minute, it's alright. It has a pleasant vintage smell, of old Southern ladies with pearls and mint julips, and leaves skin really soft. I tend to have dry, sensitive skin and I love this product, particularly during the winter when the air (both inside and outside!) is so dry. The smell is wonderful and very nostalgic. The cream is a bit thick so a little goes a long way. Anonymous "The oil is natural"
I got this as a sampler and I can't wait to buy a full size jar. I ADORE the smell and love the way this makes my skin feel. It is very rich, and even a little greasy, but the oil is a natural, essential one, so the skin easily absorbs it in. It is only to be used as a night cream as it leaves the skin shiny, but when I get up the next day, my skin is kickin'!! No other cream I have used comes close to this. It is by far the most superior product I have tried. Also, as always, it's the best feeling to know there are no chemicals and you can feel good about using this on your skin. This product is very heavy, but it's a night creme and it really works. Any day that I come home with blemishes, I put this creme on and they're gone when I wake up. Plus I start my day with radiant skin that really feels/looks good and healthy. Since it's expensive, I use it only on nights before events I need to look really good for. I wish I could afford to use it every night! Anonymous "Perfect for my skin"
Great product! It's well worth the price. I put it on my face at night, even my lips and eyelids and wake up with my skin feeling soft and creamy. The scent is very nice and light. I have very sensitive skin and this product is just perfect. This smells soooooo horrible!! I love Burt's bees and have tons of their stuff, but this is the worst I have ever used. It has the consistency of shoe polish; heavy, greasy, and non-spreading. Totally terrible. Maybe it would have worked, but I just couldn't wait to wipe it off. Try Burt's marshmallow cream instead; it is great. Anonymous "I use it on my feet only"
Oh dear God, what is that layer of smelly, greasy, film on my face?! This was one of the first Bees items I'd ever tried from my sampler kit, and UGH. I'll use it on my feet only. I'll be honest. At first, I hated the stuff. It came as part of a starter kit and I found it kinda stinky and too greasy, so I put it aside for a while. Then as I found myself buying more Burt's Bees products, I read that this creme is 100% natural and decided to give it another chance. This time, I used only a tiny amount (more if my skin was particularly dry) and rubbed it gently. I also didn't find it smelly as before, actually kinda liked the smell especially since I wasn't overdoing it anymore. The best part was how soft and silky my skin is in the morning. The key to using this creme is using very tiny amounts. I think the jar will last me a long time so the price doesn't seem so high either. Also, I don't think it's a good creme for oily skin. I have normal to dry skin with a bit of a T-zone and it works great for me. I love the stuff! Ruth "My skin looks wonderful"
My skin is very sensitive and it doesn't take much to set it off. To top it off, I'm over 50, so I have a real dilemma when it comes to skin care. 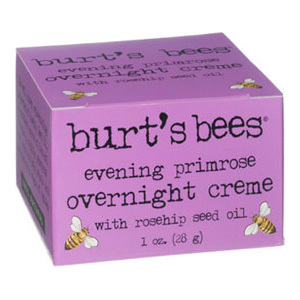 My skin just loves the Burt's Bees products and if this overnight cream seems greasy, it's only for a second until your skin absorbs it all. Dont put on too much, it only takes a little bit. My skin looks wonderful. I started with the starter kit and that was the beginning. I love it. Anonymous "I love to use it for my lips"
I like this product sometimes...when my face is really dry and parched. But where I really LOVE it is on my lips! I use it as a nice, thick lip treatment at night, and in the morning, my lips are amazing. I use just a little in the morning, when I'm prepping for makeup, and by the time I put on lipstick, my lips are perfectly moisturized and "plumped up". So, once again, I've found alternative uses for products that might not be perfect for the intended use. Although it's fine for night, it's just very thick and "greasy". I love this overnight creme. I was a little skeptical at first, because I don't like anything sticky on my skin. But, I tried it and low and behold, it does make your skin glow and look healthy just as others have claimed. The trick for me is to apply a thin layer. Also, I don't use it every night. I only use it about 3-4 nights a week. I highly recommend this product. This product is not very good. It is very, very greasy. 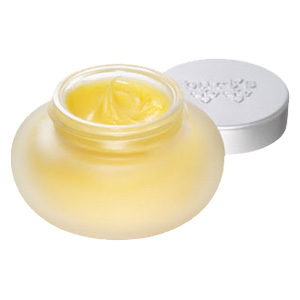 It does hydrate your skin, but Burt's Bees offers several products that do it better. The Marshmallow Vanishing Creme and the Beeswax Moisturizing Creme hydrate without the strong scent and without leaving your skin greasy. The smell and the consistency are also better. This is a very thick, rich cream to use before bed. In the morning my face is so soft I skip cleansing & just splash water on my face and tone with witch hazel & Im good to go. Ive been using this moisturizer for about a year now & simply love it. I love that instead of moisturizing in the morning & at night, this is rich enough to do only at night. My skin almost never breaks out now & the tone is rosier & healthier. Amazing. Love the scent, too! Anonymous "It makes my skin so soft"
I am a teenager with normal/sensitive skin, and this stuff makes my skin so soft. It even lets me use acne products with benzyol peroxide in it when I need to. My skin is so sensitive that it would dry out if I did not use moisturizer. I swear by this stuff. Love it! Evening Primrose Overnight Creme is shipped in a discrete, unmarked package. Orders are processed immediately and usually take about 3 to 5 working days to be received. We do ask that you try it for 2 to 3 weeks to feel the full effects. Any information received is used only for order processing and shipping purposes. Your information, such as e-mail address, will never be disclosed to a third party.